Making a magazine from scratch is no small task, but our founding team, Katie Proctor, Sarah Gilbert, Robin Jennings, Kristi Wallace Knight, Melissa Brumer, Kathleen Youell, and Harmony Spangler, came together with such dedication and enthusiasm and talent. We were able to make something really great quite quickly for our debut at BlogHer ’12 in New York. Genesis, the first issue of Stealing Time, was over-funded via Kickstarter in August, 2012. I worked with the magazine’s editors and graphic designer Harmony Spangler to craft a visual identity from scratch. “I like how The Sun looks,” hinted Editor-in-Chief Sarah Gilbert. From there, we ran. 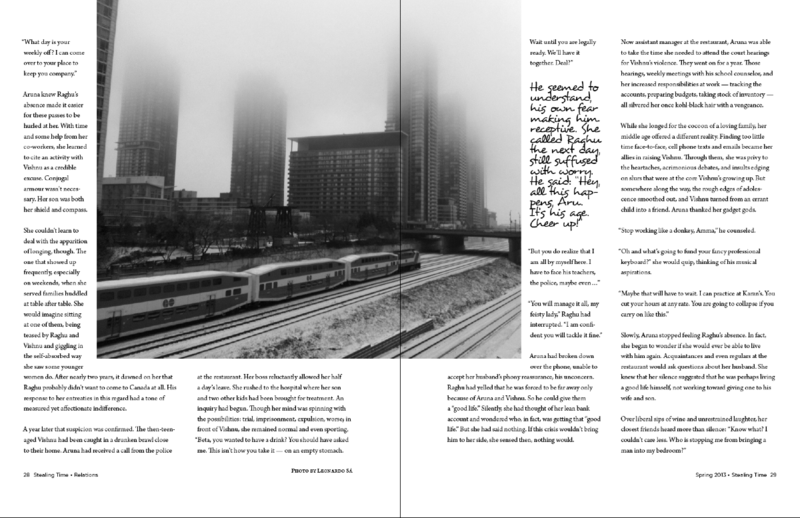 Into It All: The first spread in the first issue of our new magazine! The body typeface is Arno Pro. I love how proper it is, how very bookish. I chose large margins, hanging punctuation, and this “handwritten” face for title, drop caps and pull quotes to create a classy, friendly look for the magazine. Knowing that this magazine was created by busy parents and read in stolen moments, I wanted our readers’ eyes to be able to rest and relax while escaping for a moment into the beautiful images and thoughtful prose. A moment during an early meeting around my dining room table, captured by Sarah Gilbert. I am at the left, next to my daughter Finch, who was so sure she should help me request print quotes. There’s Robin Jennings (center) and Kristi Wallace Knight (right). It was such a pleasure to work with these talented editors. I was tempted to make measurements and guides, using them to force each element into some kind of mathematical relationship to one another. Instead I squinted my left eye shut and wiggled things around until it all felt right. 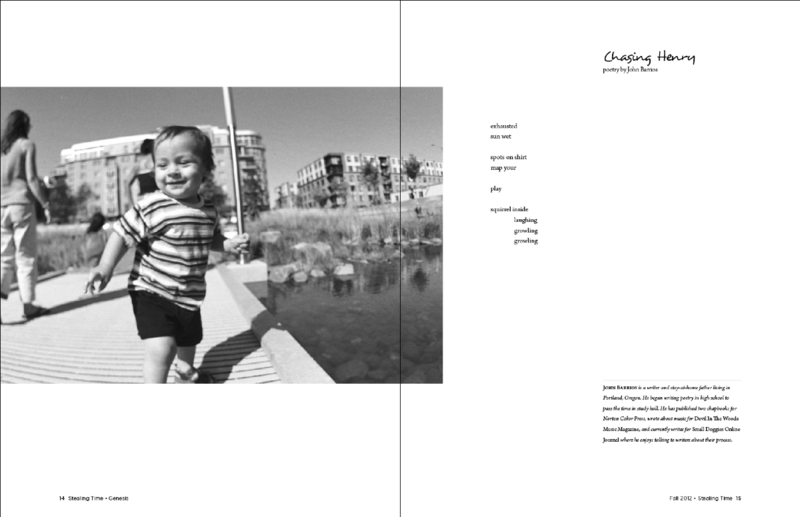 Chasing Henry: It was easy to set this short poem by John Barrios with one of Sarah Gilbert’s beautiful images. I just love the photo on pages 28 and 29. It was taken by Leonardo Sá. I knew immediately that I wanted to feature it as prominently as I could. It took a lot of fiddling to make the text and pull quote flow around it in a way that worked for all of the components of the spread. It was worth the effort. I felt instantly that this poem, Tethering, by Molly Sutton Kiefer and photograph by Brandi Fitzgerald were made for each other. I loved them together so much that I moved the author’s biography to the facing page, breaking one of my own guidelines for the magazine’s design. We fit a lot of content into the Relations issue. This photograph by editor-in-chief Sarah Gilbert, demanded (politely) to be spread out big in our pages. 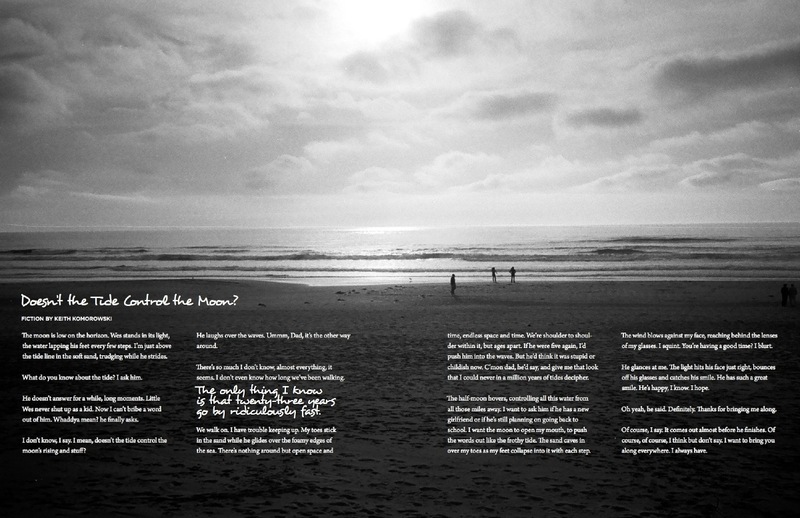 In order to make room for that and all of Ken Komorowski’s text, I reversed out the text, added a thin black stroke for increased readability, and set it in the sand.